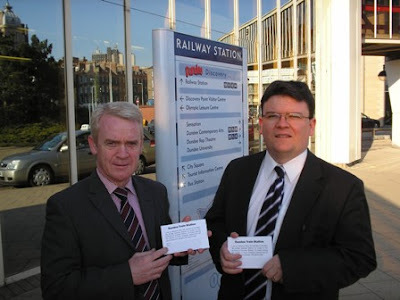 I support improving train services in Dundee. The top priority on this needs to be improving Dundee Station. One of the ways to make the case for improving Dundee Station is to have more train services there. We need an integrated transport system in Dundee. We should definitely look at getting more trains to Dundee. One of the ways to do this would be to support the Tay Estuary Rail Service. This would have trains operating regularly between Perth and Montrose and might even include new train stations. I think that people would use this service if it was available and if it was regular and reliable. I am looking for progress on this project and I hope that TACTRAN, the local transport partnership will bring forward plans to deliver this sooner rather than later. Action is required. I support Macmillan Cancer Support's campaign 'Put the Fair into Welfare.' I've admired the work of the Macmillan Cancer Support in securing that appropriate levels of benefit support for cancer patients. Macmillan Cancer Support are concerned about the proposals in the Conservative-led Government's Welfare Reform Bill which they believe may penalise people with cancer at a time when they most require support. I have many concerns about the Conservative-led Government's proposals for welfare reform. I was surprised to find out from Macmillan Cancer Support that they have concerns about the impact on cancer patients in particular. The financial impact of a cancer diagnosis can be devastating and sudden. As well as facing extra costs as a result of their cancer treatment some people have to leave work. As many as 91% of cancer patients' households suffer loss of income and/or increased costs as a direct result of their cancer. Some people with cancer will lose critical financial support after only one year. This isn’t long enough. People with cancer getting the same drug, but administered in different ways, are being treated differently in the benefits system. This is unfair. People with cancer will have to wait six months before they can apply for the new Disability Living Allowance. It should be available straight away. It is important that people who are ill are not given extra burdens at what is without doubt a very difficult time. I am happy to support Macmillan Cancer Support's campaign and I hope that MPs will support this important campaign. I have made clear my support for the Robin Hood Tax on a number of occasions. I used to campaign for it when I was the National Secretary of the Justice and Peace Commission of the Catholic Bishops' Conference of Scotland and the policy was called the Tobin Tax. There has been a global economic crisis, most of which was the responsibility of the bankers. Although I am clear that all the main political parties have a share of the blame for not regulating enough. The consequences of this are being felt across the world; in the developing world in places like Kenya but also in the classrooms of Dundee. I support the Robin Hood Tax because I think that the banks should pay for the problems they have caused. Please support the Robin Hood Tax. I have made clear my views on the report by Save the Children on child poverty in Scotland. Labour leader Iain Gray has made his views clear on this, he has rightly drawn attention to Labour's campaign for a Living Wage. This campaign is proving popular with local people and I hope that it will soon be implemented. Scottish Labour leader Iain Gray described the SNP response to Save the Children report on Child Poverty as inadequate and said Labour would bring in policies - if elected - that would directly benefit Scotland's children and families. “The Save the Children report on children in severe poverty concentrates on the role job creation and low wages can play in helping children out of poverty. “Labour in Scotland has the policies to combat the effects of Tory cuts and the impact they will have on children in poverty. 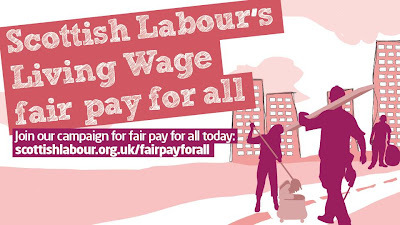 “We are committed to a Living Wage to lift people out of poverty so no one who is working suffers from poverty. “At the same time we will bring in a new Future Jobs Fund within 100 days to create 10,000 jobs. “We will continue to campaign with our colleagues down south in leading the Labour fight against the Tory cuts. I'm really concerned about Child Poverty in Dundee. A report issued by Save the Children, called Severe Child Poverty in Scotland, highlights the issue and points out that Dundee has relatively high levels of child poverty. I've written to the Chief Executive of Dundee City Council asking that this report is considered by Dundee City Council and the Dundee Partnership. One child in poverty in Dundee is one child too many. Everyone in Dundee needs to work together to ensure that no child is left behind. We need to do all that we can to alleviate poverty in Dundee. Cuts in public spending will have an effect on children's lives. I am concerned that VAT increases and rising inflation will have a greater impact on poor families than any on other families. The rising cost of living is difficult for everyone in Dundee but it has a particular impact on the poorest. Most child poverty occurs in workless households, this is why jobs are my top priority. We need to do all that we can to attract new jobs to Dundee and we also need to work hard to retain jobs in Dundee. For some of these parents we need to ensure that they receive appropriate training opportunities to allow them to enter the workforce. We need to ensure that affordable, reliable and flexible childcare is available which will help parents into employment. The Conservative-led government is making changes to the tax and benefit system it is important that this doesn't have an adverse impact on child poverty. The City Council should consider ways in which it can promote access to benefits through its Welfare Rights work. We need to provide the poorest families with support which will allow them to cut down on costs. For example, it is important that fuel poverty is dealt with, and that the costs of gas and electricity are looked and that help is given to ensure that fuel is used efficiently. We have a duty to get it right for every child and therefore we need to ensure that educational attainment is boosted for every child in Dundee. Poverty has a particular impact on education and we must do everything possible to alleviate its impact. Poverty is unacceptable in this day and age, I am clear that employment is the best way out of poverty, that is my jobs are my top priority. On Monday evening February's Development Management Committee was held. There were a number of planning applications considered. The plans for the new schools in Charleston for St Clement's Primary and the new amalgamated Lochee and Charleston Primary schools was passed. I was glad that my colleagues Kevin Keenan and Laurie Bidwell put the case for ensuring child safety at this site during the building works. I look forward to this investment initiated by the previous Labour-led Administration. My ward colleagues voted against a mobile phone mast on Ninewells Avenue on the grounds that all four mobile phone companies should share masts. I think that there is a lot in this argument but I don't think that it can be done via planning legislation. I will be writing to Liberal Democrat minister Vince Cable who I think is responsible for this matter. I welcome the news that the public toilets at Dundee Station are to be refurbished. I believe that this is a start but that there is a need for a much more comprehensive refurbishment of Dundee Station. I am pleased that the public toilets at Dundee Station are to be refurbished. I welcome this work by ScotRail but I think that it is obvious that much much more is required to improve Dundee station. I know that work is ongoing to bring about the comprehensive refurbishment of the station but I think that it needs to begin sooner rather than later. Dundee station is a poor advert for the city. It will look out of place with the V & A when it comes. I have been campaigning for the refurbishment of the station for a number of years and I want to see action. Along with Jim McGovern I have been campaigning for improvements at the railway station and will continue to do so. As Labour's Leisure, Arts and Communities spokesperson on Dundee City Council I have called for support for Dundee's libraries. I've signed the petition entitled 'Love Scottish Libraries' which is organised by CILIPS (Chartered Institute of Library and Information Professionals in Scotland) to show how important libraries are to the people of Scotland. I regularly use public libraries, I have a weekly surgery in Blackness Library. I know that the people of Dundee love their libraries. The Central Library regularly comes out as Scotland's busiest library. I did most of the research for my PhD in the Local History Centre in the the Central Library. I was delighted (in March 2009) to donate a copy of a book which I written a chapter in to the local studies library. The City Council's Administration recently voted through proposals to put Dundee's libraries into a charitable trust. As with many things the devil is in the detail with these proposals, I will be keeping a close eye on the proposals. Dundee's excellent network of community libraries must be maintained, investment in stock must continue and access must be maintained. The excellent work by the staff in Dundee's libraries must be encouraged and maintained after these proposals come into effect. If you love your local library then I suggest that you sign the petition to show that you do.